Posted on March 6, 2017 at 11:27 pm. DeepStack computer program beats 11 professional poker players. Artificial intelligence has taken a huge step forward, with a computer beating several players in a game of professional poker. A computer program known as DeepStack, created by scientists from the University of Alberta in Canada, defeated 11 professional poker players in a game of heads-up no-limit Texas Hold’em. The International Federation of Poker recruited the players in December 2016 who have since played 3000 hands over four weeks against the program. This is the first computer program which has beaten this many professional poker players in a game with so many unknown variables. It also referred to the program’s ability to develop a form of “intuition” honed through deep learning to reassess its strategy with each decision,” which enabled it to win. Skill-based games require logic and reasoning, which is why poker has always been presented as a problem for artificial intelligence. “It is the quintessential game of imperfect information in the sense that the players don’t have the same information or share the same perspective while they’re playing,” Principal investigator of DeepStack, Michael Bowling, said. 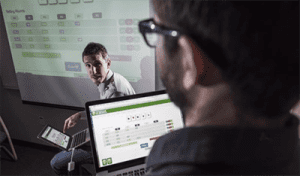 DeepStack uses a special technique known as continual re-solving, which lets the program determine the correct strategy for the given poker scenario, without forcing it to “think” about the whole game. “We train our system to learn the value of situations,” said Mr Bowling. “Each situation itself is a mini poker game. While poker players can take quite a long time determining their moves, DeepStack only requires three seconds of “thinking” time on average. Computer scientists led by Carnegie Mellon University professor, Tuomas Sandholm, have also seen similar results with a program called Libratus. Four professional heads-up no-limit Texas Hold’em players, including poker pro Jason Les, played 30,000 hands against the program, which eventually won. Mr Les said the program was tougher than any other poker player he has played before. “The best AI’s (artificial intelligence’s) ability to do strategic reasoning with imperfect information has now surpassed that of the best humans,” Mr Sandholm said. Teaching computer programs to deal with covert information could eventually lead to real-life applications such as cyber security and business negotiations.